Pixel art has certainly not disappeared into the mists of gaming history. If anything, in our nostalgia-heavy age of reboot-a-thoning, the pixelated style holds its place firmly as a manageable form that can evoke those classic retro feels, whether by intention or not. 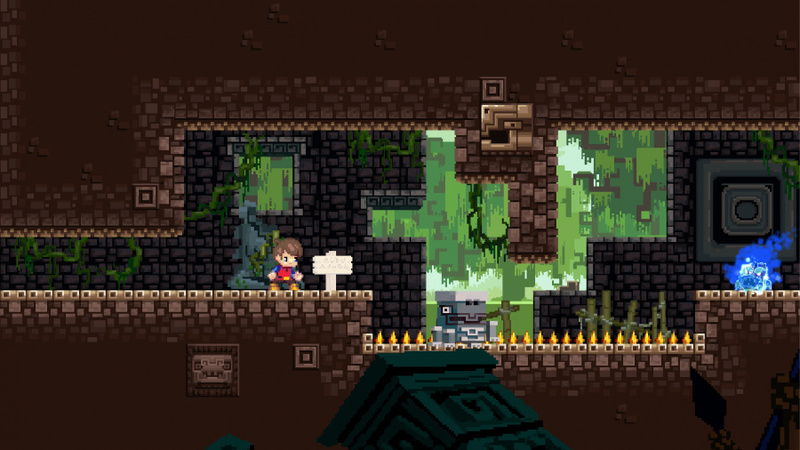 While it's a sound gimmick, it's not as often that we see pixels and bits woven into the primary sense or theme of a game itself; at least not as nicely as in Adventures of Pip. Not only that, but the developer has managed to make a good platformer experience out of it, to boot. Pip's world is one where people exist in multiple resolutions, creating a sort of tongue-in-cheek caste system where more detail commands more respect. The hero starts out as naught but a lowly pixel, but will be able to upgrade twice to change his abilities. Pip gains a humanoid look in his 8-bit form, gaining speed and the ability to wall jump. Another shot up the scale, to what looks like a 32-bit form, gives Pip the heft to swing a sword and move certain blocks. 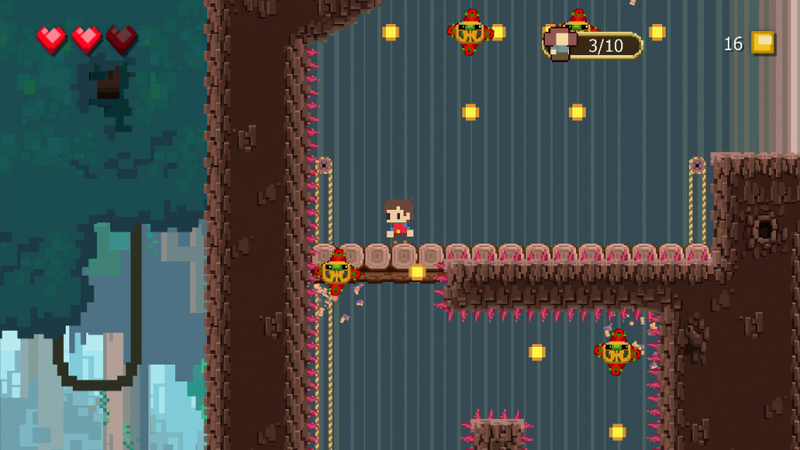 Although resolution goes up, The Adventures of Pip relies heavily on making the most of the three forms' abilities. While 32-bit Pip is more powerful and able to manipulate the landscape more, he is slower and can't scale walls as well as 8-bit Pip can. Even pixel Pip has his own strengths, being able to slip through small spaces and more distinctly control his descents. No one version of Pip seems "superior" to the others, and you'll happily get plenty of time with all of them. Morphing happens quick and often in this world. Destroying one of many glowing, crystalline creatures found along the way will make Pip "evolve" upward a resolution, and the player is free to "devolve" him down a notch at any time by holding the LZ or A buttons. The fact that the "power-up" creatures infinitely spawn means a player should never get trapped in one spot, which opens up plenty of opportunity for puzzle-solving and exploring. Sometimes progress will mean a quick change between forms, even in mid-air, and figuring out the way forward often feels satisfying. Seeking out secrets, unfortunately, doesn't feel quite as rewarding over time. Stages are practically bursting with little hidden alcoves and areas, and finding them initially feels great. Give it a bit of time though, and the incentive starts to feel lacking. Secret areas are most often filled only with chests containing the game's currency and nothing more. This loot can buy you some one-time recovery items, aids, or eventually permanent boosts, but the costs of these helpers is high and often don't feel necessary. There are also three villagers hidden away in every level, but no real reason is given for finding them except for seeing them back in town. Given this situation, it can start feeling like there are too many secret areas to find for what you get out of them, and passing them by eventually doesn't feel so shameful. if you're a completionist, though, this should tack plenty of time onto the estimated 5 to 7 hours of gameplay. The core of the game remains quite competent, however, with fun and at many times challenging platform sections. A handful of checkpoints are scattered through stages that will restore health and provide a respawn point after dying. Even if the game gives you infinite chances to get through, there were times when it was still quite a relief to find one of these havens. The world is lovingly pixelated, as you might expect, and blends different resolutions together well. Expect about 8 or 9 stages per "world" of the game, and although they do have some differing elements in them, the general backdrop of each might tend to start feeling a bit tired toward the end. It would have been nice to see a bit more variety in spots, or perhaps more of the fun, humorous dialogue that lightly peppers the game. The orchestral-inspired score, on the other hand, blends spectacularly with the worlds and is worthy of many listenings. Sold! Will pick it up ASAP! Looks Fun! I love platformers, so I might get this. I've been waiting on this one so I will pick it up soon. I want this game so much, it just looks stunning. I hope they sort a PAL release soon - I wonder what the complication could be? Man I still need to get Elliot Quest... This looks good too. Looks great. Any 3DS version guys? I will eventually get it. Looks fun. Pip pip hooray! 1st game I ever backed on KS & the first to deliver. Really love the pixel visuals on the big screen, with great music by Virt Kaufman to boot. Enjoying the game so far. 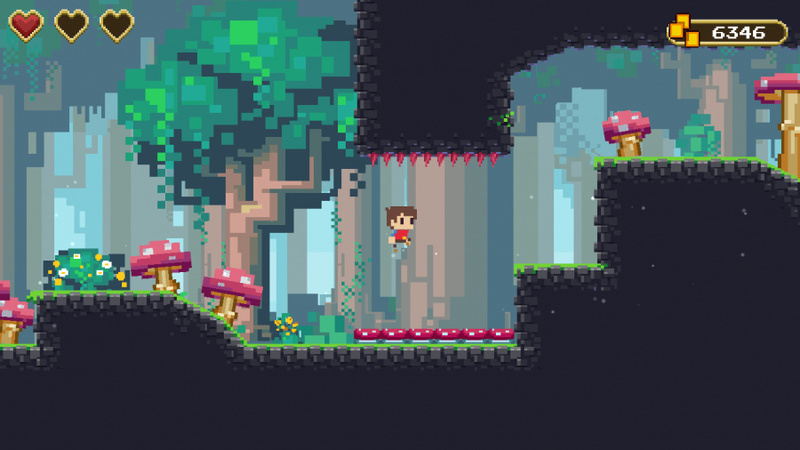 Definitely recommend to fans of pixel platforming awesomeness. Backed on KS, I'll give it a whirl later. I like the idea of graphics morphing but it can get annoying as well. I had an idea for an similar game as well. I liked the idea but then i saw the queen in her Vector graphics self hovering above in the beginning. That makes no sense at all. It would be nice as the "new comix zone" but otherwise it looks like something to check out one day. I don't like the blue knight ghost thingy. I wish it was different. @RegalSin I'm not sure what you mean. What about the queen doesn't make sense? How does she make less sense than someone who can move between different eras of graphics? Why and how do you compare this to Comix Zone? Why does the blue knight bother you? So many questions! @treeofmana the beginning of the game is the little pixel running across the screen with the "Antagonist" who simple warps her way to laugh at you, in her Vector graphics form. It is like the queen knows you are coming some how, and while I have seen that before, it removes the sense of being lost of mus-directed in the game itself. If the game had shown the animation ( in game ) of the world being stolen it's pixels by the queen as she warps the princess away it would make sense. Comix Zone takes you inside the world of an Comic-book. This game makes an extremly big deal about graphics and as you progress the graphics are suppose to get advance ( to the point of the recent Rayman games??? ). I mean omgsh Castle, ghost knight from "Ghouls and Ghost comes to help you". Simple it is the same thing Viewtiful Joe where "Captain Blue" shows up to give Joe and Tutorial. Imagine Power Rangers, and the bad guy flies in to mock the player, or Rita is in the background laughing. That makes sense. This looks like Bowser in his Clown car just mocking you and then not appearing until far later in the game, from Super Mario Brothers. Not like Bowser in MarioRPG that steals the princess ( see the logic ) and Mario jumps into action from his flat. Don't have the game (yet), but just listening to the music on band camp and the Jake Kaufman soundtrack is great. Huge fan of his since his Shovel Knight work and didn't even realize I had listened to his excellent music on Mighty Switch Force and Shantae games. Nice review and nice score. Will download someday. Jake Kaufman heh! Always good! gonna get this once its on sale for sure - it looks fantastic!